Here we have yet another plastic surgery nightmare gone horribly wrong and this time the poor victim was raising Indian actress and model, Koena Mitra. 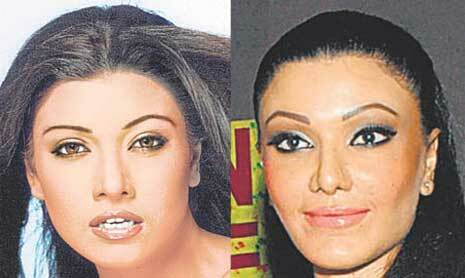 Koena Mitra went in for a nose job (Rhinoplasty) at the advise of her handles and later revealed it was nothing short of a disaster, with her cheekbones flaring up making it impossible to smile. She later visited a second doctor who suggested facial injections to ease the swelling, which returned her face to a somewhat normal appearance, however the results of the botched nose job still remains. Koena Mitra before and after picture. Clearly Koena Mitra has also had a few rounds of injections into her lips as well, plus she is rumored to have had breast implants (breast augmentation). And not surprisingly, this plastic surgery mishap has stunted her career as we once knew it. She can't help it if the nose job went bad, but what's up with these fat felt tip marker pen looking eyebrows with too much angle? They're so harsh and angry, like Cruella Devile's. Her hair and eyeliner colors are waaaay too dark and also harsh. Makes her look like a hardened junkie. Look how much better she looked in the before shot with much softer colors and shapes. god made us btful the way he did. we shld remain that way! i got veneers to improve my smile as i had gapped teeth. but now i regrett. i miss my old hard teeth. thou crooked, but still atleast they were real. i wish i cd go back bt i cant. so anyway, b as god made u. go with nature. its lovely. She was stunning b4 the surgery & now, she looks worse than MJ. Even with all that money she can't help herself.